Did I get your attention when I wrote Cadillac to Lamborghini? I sure hope so! About 4 years ago we had the privilege of getting an entirely new website, revamped from top to bottom, designed by Mark Smith of Max Cadman, Strategic Web Marketing. Mark told me that our website is a Cadillac. But I’ve since discovered that it’s even more than that! 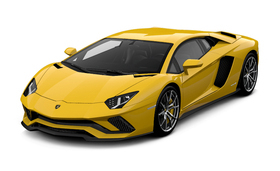 It’s a Lamborghini! What does this mean for you? It’s a great thing really! First of all it means our website is unique. 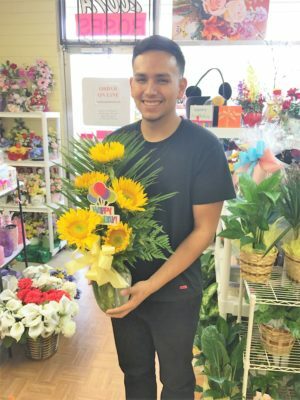 We post pictures of beautiful floral arrangements that we sell from our local flower shop, not copies of arrangements you’ll find all over the Internet. Second, it means we take pride in providing the best customer service we can. Third, it means we invite you to visit our Yelp or Google pages and read our reviews! 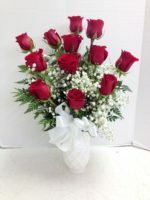 Fourth, you are welcome to visit our Facebook page and view even more great floral arrangements and gift baskets there! Most important of all, it means we are unique, just like you are, and our designs are perfect expressions of your love. 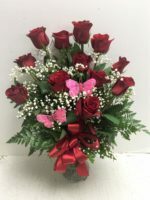 The Society of American Flowers posted this article entitled Why Flowers. In a nutshell it says Flowers Make People Smile! 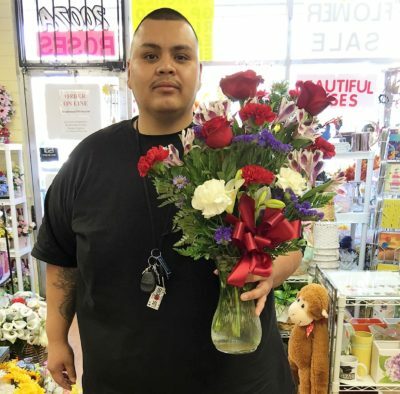 Do you remember the last time someone gave you flowers? What about the last time you gave flowers? Chances are, that memory is vivid. And there’s a reason why: Flowers come wrapped in emotion. Since the dawn of time, people have intuitively known the power flowers have on feelings. Only recently our intuition was proven right. Researchers at Harvard, Rutgers and Texas A&M universities have conducted studies proving flowers make people happy, spark creativity and decrease anxiety. 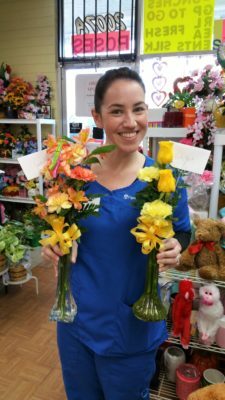 Research conducted by psychologist Jeannette Haviland-Jones, Ph.D., of Rutgers University proves the presence of flowers triggers happy emotions, heightens feelings of life satisfaction and affects social behavior in a positive manner far beyond what is normally believed. “Common sense tells us that flowers make us happy,” says Dr. Haviland-Jones. 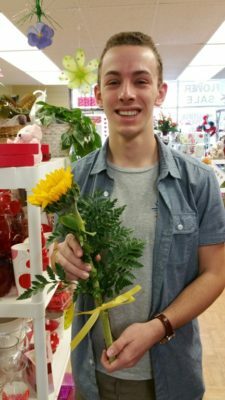 “Now, science shows that not only do flowers make us happier than we know, they have strong positive effects on our emotional well being.” Her research also shows flowers make intimate connections, even inspiring increased social activity among seniors in addition to easing depression. Nancy Etcoff, Ph.D., of Massachusetts General Hospital and Harvard Medical School, also conducted a behavioral research study about flowers. 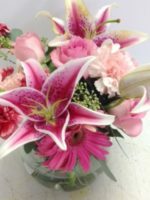 Her research reveals people feel more compassionate toward others, have less worry and anxiety, and feel less depressed when flowers are present in the home. 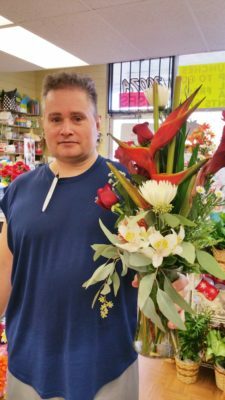 “As a psychologist, I’m particularly intrigued to find that people who live with flowers report fewer episodes of anxiety and depressed feelings,” Dr. Etcoff says. While research shows flowers are good for you, the best part of flowers is they’re fun! They come in so many beautiful colors, shapes and styles. Like fashion, you can use flowers to express your individuality. Flowers in different combinations can be classic, contemporary, playful, bold – even sensuous. So, whether you want to share a bunch of happy, say, “I’m sorry,” “thank you,” or “I care,” flowers can do it. They touch your senses of sight, smell, touch – and that, when combined with a personal note, is unbeatable at sending a powerful message. Beyond the message, giving flowers says something about you, too. 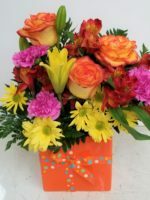 Research shows people who give flowers are perceived as thoughtful and sophisticated. Who doesn’t want that? We dare you to conduct your own scientific experiment to test the power of flowers for yourself. 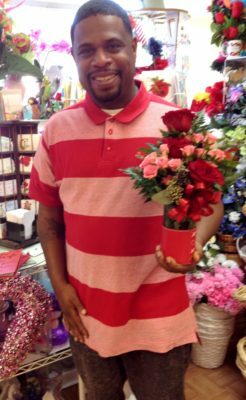 Here’s an easy way: Stop by the next florist shop you pass and pick up a bunch of flowers to go. Walk down the street, and watch and see just how many people smile at you, look in your direction or even start a conversation. Just because. 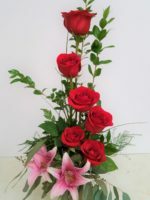 As you know if you follow us on Facebook, we love posting picture of our beautiful floral arrangements. Sometimes people ask us to text them a picture, which I do quite often. Mostly we enjoy them until they walk out of our shop for delivery, and then we know the lucky recipients are going to enjoy them, too! 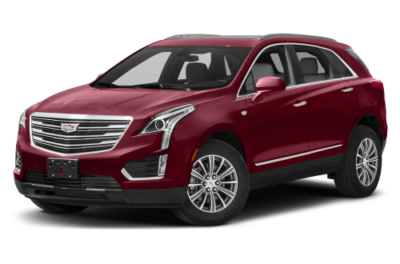 If you’re in the market for a Cadillac or a Lamborghini, you’ll find our website is the perfect place for you to shop!